This is an awesome tasting cake. One reason I wanted to try this cake was because it is small. Since my husband and I are now empty nesters, I don't want lots of dessert sitting around. Another reason for this cake is because I love cranberries and apples together. The cranberries and apple are mixed with brown sugar, cinnamon, orange juice and zest, and placed in baking dish. Then batter is spread over the berry mixture and it bakes and is ready to eat as soon as it comes out of the oven, if you wish! And boy does it smell good while baking! It is better served warm, so there's no torture waiting for it to cool down. Add whipped cream or ice cream if you wish. I like it best without adornment, so I can taste the lovely tart fruit that is infused with cinnamon and orange. I'm addicted. The only changes I made were minor; I used low fat sour cream because that's what I had. I only used the zest from 1 orange, instead of 2. 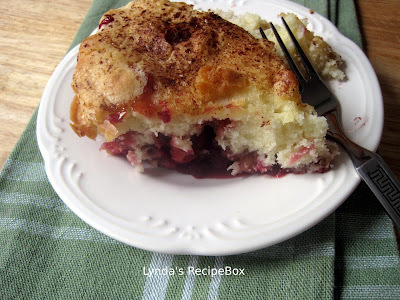 This Cranberry and Apple Cake would be delicious anytime, even for Thanksgiving dinner. I even had it for breakfast this morning (hehe). I hope you'll give it a try. NOTE: There is no baking powder or soda in this recipe. 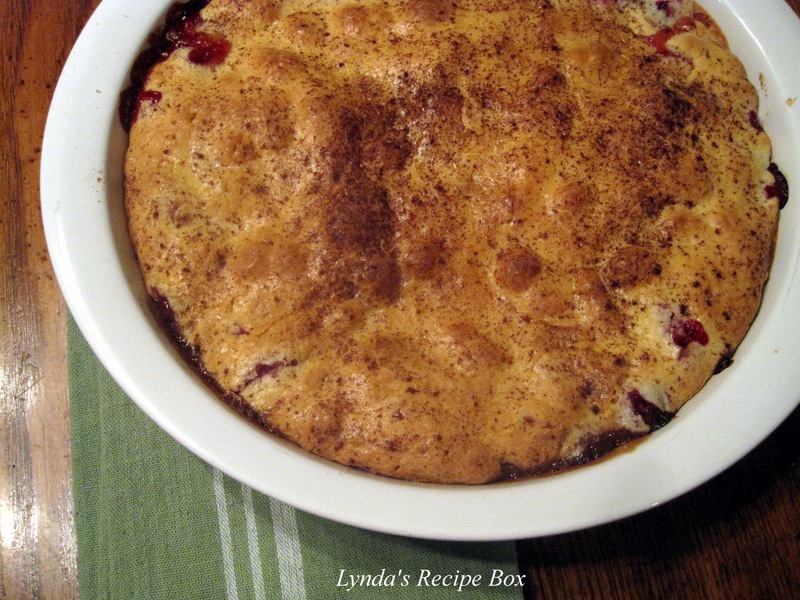 Combine cranberries, diced apple, brown sugar, orange juice and zest, and 1 teaspoon cinnamon in a bowl. Set aside. In a large bowl, beat the eggs on medium high speed for 2 minutes. Add the 1 cup sugar, melted butter, vanilla and sour cream and beat until just combined. Slowly add the flour and salt at low speed. Pour the fruit mixture into a 10 inch pie plate. Pour or spoon the batter over the fruit, covering completely. Sprinkle top with mixture of 1/8 teaspoon cinnamon and 1 tablespoon sugar. Bake for 55-60 minutes. Serve warm or at room temperature. Try not to eat the whole thing! I also love the cranberry-apple combination and small is good for me. I am of the school of thought of "I'm not hungry, I'll just pick!" And this is what I'd like to pick. Definitely my kind of cake! It looks delicious. It looks wonderful - I love the cranberry & apple combination. Oh,I think anything of Ina's is just about perfection. This looks like a really nice autumn cake.